I learned about Japan when I was doing my undergraduate studies in my own country. The actual landscape of this country overwhelmed me when I landed in Kansai International Airport. Everywhere in Japan, you can see distinguished features and mesmerizing significance. It is well-known around the world that the Japanese are very humble, sincere, helpful, and hardworking, possessing many good qualities. My dormitory is fully equipped with modern facilities. I am very comfortable living here. After coming in Japan, I visited several interesting places. I was delighted to see the enigmatic and tranquil temples and shrines. During my holidays, I play football with my friends. I truly enjoy the varied aspects of my life here. It has been 10 months since I participated in Leading Program, and the environment here��oth natural and human��as made the most significant impression on me. The scenery around campus is very beautiful and I can enjoy fresh air every morning; I am fortunate to have the opportunity to study here for five years. Regarding human environment, everybody here is very polite and willing to lend a helping hand when I encounter difficulties. In addition, I have experienced colorful Japanese culture and enjoyed delicious Japanese cuisine during the last 10 months, so I am looking forward to the next four years. After being here for six months, I see that life here is very different from my previous places of study. The most significant different is the culture. Work, social life, education, temperature, and food here are very different from my home country. However, being different does not mean that I do not enjoy it, and sometimes I very much enjoy these differences. I can learn and try many new things here, and I particularly enjoy Japanese food. As a doctoral candidate in a country foreign to me, I take student life as a personal challenge and opportunity to develop my personality and learn communication and leadership skills. Research, experiments, and presentations are the focus for doctoral candidates in biology. Because I have a different major background, my supervisors and lab colleagues have helped me to master those challenges. Overall, I enjoy my new environment here very much, which is surrounded by beautiful nature. I look forward to more good experiences. It has been seven months since I came to Japan, and I gradually became accustomed to life here. The natural environment around our campus is extremely beautiful, even breathing the air lifts my spirits. The teachers and students are friendly, and they helped me in all aspects of my adjustment during the first several months. Learning Japanese has been challenging and interesting, but thanks to the Japanese course on Wednesdays, I am learning Japanese systematically and learning about Japanese culture by talking with the volunteer. I am extremely satisfied with my life at the university. There are many tasks: PhD research, lectures and activities related to the leading program, in the leading program. So, I felt that it was important to manage time to perform tasks effectively. I think that time management will contribute to my research and to society in the future. I often feel stressed because the leading program requires many things, but this environment makes my life fruitful. In the half period of the first grade FY, students are very busy attending training courses and various lectures. After that, I mainly worked on my research subjects, while completing other curriculums, which are fortunately better spaced out. Because I have entered into this Ph.D. course as a third-year student, I must plan my curriculums to satisfy the conditions for graduation, and management capability is a requisite. I live in a dormitory that is located very close to my lab, and this environment contributes to my research. Also, our university is surrounded by beautiful nature, and the air is very fresh and clean, and the stars are brilliant at night. In the half year of first grade FY, we experienced Spring-8, SACLA, J-PARK, and learned high performance computation using supercomputers. It was important for me to learn the ��rinciples��of the experiments and theoretical analyses, rather than their practical aspects. Next, we will draft proposals based on our own research subjects. I aim to elucidate functional mechanisms of biological macromolecular systems, and design novel pharmaceutical compounds, using various computational and theoretical techniques. For this purpose, I plan to develop a novel theory based on non-equilibrium thermodynamics and the information theory. Thus, it is crucial for me to learn the basic theories on physics, chemistry, and computer science as well as life sciences, thereby unifying the principles as my own methodology, which should be applied to the above-mentioned analysis of biological systems. This program combines lectures and other activities with research assignments. It sometimes seems difficult to do everything together, but I believe this experience will likely become a lifelong treasure. Thanks to the support of the people around me, such as other program students, friends, and lab members, I'm having a wonderful time in this course. My life as a student involves conducting research. I am currently analyzing the catalytic mechanism of protein using computer simulations. For performing an exact analysis, I need knowledge about many fields beyond just biology, for example, mathematics, physics, and programming. Therefore, I try to learn more about different fields through my research in order to improve myself. Moreover, I tend to discuss my research with other laboratory members in order to achieve good results as far as possible. It has been almost 1 year since I joined the leading program as a foreign student. Adaptation and settling in this new place was not very difficult because of immense help by the Professors and student welfare officers. Moreover, the students here are very helpful and I was guided very well by them. The retreat program is a very good opportunity for interaction and gathering knowledge through group discussions with professors and students. Life here mostly revolves around lectures, trainings, experiments and assignments but the barbeque parties and seminars in different places are great refreshment. The professor and colleagues in laboratory is very kind and, help me get through the first couple months of Japan life. The dormitory is more neat than any other student dorm I been in, also fully equipped and close to the research building where my lab locates. The food in cafeteria is also quite to my appetite. The only flaw is that it will be little bit inconvenient without an automobile. 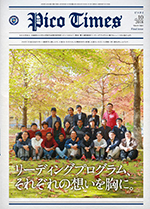 As a foreign student for the leading program, I have already been in Japan for approximately two years. During the two years, through lectures, we try to understand various perspectives from different students for the same question. We are all good friends interacting with each other and acquaint ourselves outside the class. I am currently conducting research on crystal structure analysis of photosynthetic protein. I conduct my research through daily discussions with my instructors and through trial and error. I have a very fulfilling student life, not only in the laboratory but also in terms of my research presentations and reading programs. The research program further offers me opportunities to visit various places around the world. As a student, I can take chances without risk of failure; thus, I enjoy undertaking the challenges of new things and interests in research. On weekdays, I work in the laboratory. There are classes on some days; however, since getting into the second year of graduate school, the number of classes has diminished, and there are more instances of conducting experiments on my own. Recently, I have tried to read papers as much as possible during my spare time. I have faced many failures due to areas in which I am still weak; however, I am still having a good time. Since substantial support is provided from the program, I can spend my days focusing on research. Moreover, by participating in many conferences and international symposiums based on this support, I was able to engage in extensive interactions with people all over the world, not just Japan. My reluctance to speak in English was also alleviated by active communication with the program students in English in daily life. Life as a student is similar as always. Great time, plenty of knowledge, new friendships, high sense of responsibilities, and the list can go on. What is different is the surrounding environment. Being in a foreign country definitely needs adaptation, but it is not stressful as I am surrounded by great people, who offerimmediate help when needed. In a nutshell, I really cherish my life here. The Harima plateau where the campus is located is blessed with a bountiful natural environment where at night the sky becomes pitch black, allowing me to enjoy the stars scattered across the sky. The sounds of the wild deer at night and the rustling of the trees remind me of the grandeur and beauty of life, which is the subject of my study. Life in the dormitory away from the city has also taught me the importance of a cooperative spirit. I believe this sort of experience and the personal relationships formed here will certainly contribute to the betterment of my future. In term of learning condition, this place (Life Science Campus), is an excellent place because it located at suburban area make it far away from hustle bustle of city. Life become much easier here since shops, post office, campus and others is walking distance from dormitory. Even though this is like a perfect place with friends and teachers, but I do miss my family. Hope I can bring them to stay with me soon. As the university is situated on a mountain, I was really amazed with the natural beauty of this place. In fact, the biggest challenge was the language barrier, but as all Picobiology courses are in English and all the professors, staffs, and students in this program know English well, so it helped me a lot to adapt with this new environment. Moreover, learning Japanese from friends, sports, and the gymnasium is making my life more beautiful here. Having completed my 5 year research plan, I am at the stage where I can finally plunge into my actual research activities鐚�I plan to continue pursuing the theme of my own undergraduate study: structural studies of protein relating to cellular signaling pathways. At the same time, I participate in various activities as a leading program student (currently, planning the international symposium). It is a challenge to complete both research and all the activities for the leading students. However, based on the premise that "time management skills are a necessary quality for leaders," I am striving to rise to this challenge. I have enjoyed my life while experiencing university life outside my home country. There have been many activities organized by our university, and I took this opportunity to mingle with other students from different campuses and countries, while learning about Japanese culture and being involved in social activities. I had a lot of fun and became more internationalized. Nevertheless, most of my daily life usually focused on class assignments and research since this is my focal reason for joining this program. In research, although there have been a lot of highs and lows, I believe that it has resulted in the best. It has been hard, but that is what made it more valuable. I spend fulfilling days in the activities of the reading program, in addition to my research life. To broaden my outlook on life, I have also accepted the challenge of organizational management and economic activities outside the class. I believe that these experiences have clearly expanded my perspective. Although the need for leadership training has not been widely recognized, I believe such activities can certainly raise awareness about it. I look forward to being able to engage in innovative activities in a planned manner, to gradually attain the leadership image I strive for.